LISBURN'S Mayor Paul Porter led fellow Councillors as they paid tribute to the "bravery and service" of the Royal Irish Regiment. In one of his final acts as Mayor, Mr. Porter said: "Today is one of the proudest days in the term of my Mayorship." Speaking at the conferment ceremony, he continued: "I am honoured to see so many guests assembled today; indicative of the incredibly high regard in which the Royal Irish are held. "We confer this honour because of the gallantry, bravery and the sacrifices made and endured by the Regiment over many years. The Royal Irish are held with the deepest of respect for their invaluable and distinguished service to our Nation throughout the world, particularly in Northern Ireland, Iraq and Afghanistan. 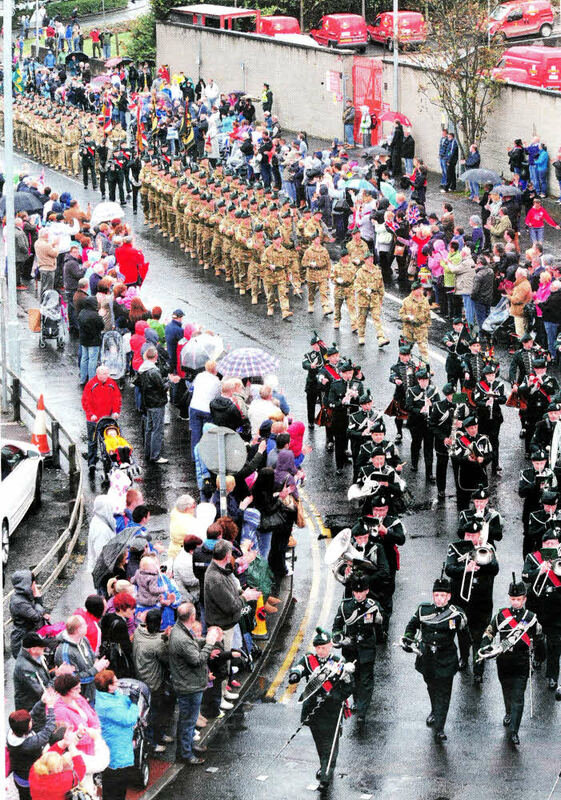 "Lisburn, a long-standing garrison town, with a proud history has a close attachment to the military. Today with the conferring of the Freedom of the City we hope a bond will be cemented and a close relationship continued, with the Royal Irish. "I would like to congratulate all of you who are on Parade here today. You have done your Regiment proud, both in your turn out and duties this afternoon, but more importantly through your commitment and bravery to ending tyranny and conflict both at home and across the globe." "It is particularly fitting that today's ceremony has coincided with the return of the Regiment from their recent Tour of Afghanistan. "This is the highest honour that the Council can bestow and it demonstrates the City's deep regard, respect and gratitude to the recipient. He added: ' While today is about praise, honour and recognition, the people of Lisburn are acutely aware of those who have lost their lives or have been seriously injured in the line of duty, both home and overseas. Our gratitude and respect is ever present and we continue to think of them, and their families who are left behind, throughout today's events. I have a message for the Royal Irish to take back with it today. Your work is invaluable. The valour and bravery shown by your serving personnel is second to none. Whatever your next assignments may be please be assured that you have the 100% backing of the City of Lisburn and our thoughts and prayers are with you." Speaking at the dinner, Councillor Ronnie Crawford said: "In the space of four days the Queen has achieved what our politicians could not achieve in four centuries, because she has brought the peoples represented by the harp and the crown so much closer together and it is sublimely appropriate in this week of all weeks that we are gathered here to confer the highest honour this city can award to a Regiment whose emblem is the harp and crown. "Today we are also recognising the huge contribution made by all the antecedent Regiments going back as far as 1689 - the Royal Irish Regiment, the Royal Irish Fusiliers, The Royal Inniskilling Fusiliers. One has only to look at the Battle honours of these Regiments to see they were engaged in conflicts all over the globe in service of the crown. "Of the 1350 Victoria Crosses awarded since the medal's inception, some 190 have been won by Irish soldiers, highlighting the courage and dedication of the Irish warrior and we are immensely proud today of our Royal Irish Regiment which has just, returned from distinguished active service in Afghanistan." Councillor Jonathan Craig, said: "These men and women have served their country abroad in the fight against terrorism in order to bring peace and stability to the Middle East. This day isn't about war; it's about our soldiers from all walks of life, many of them very young, serving their country far away from home. "It was great to see so many people out on the streets to welcome them and cheer them on, especially given the weather. 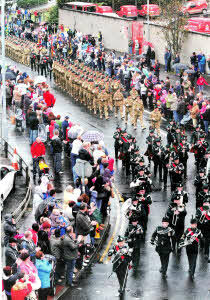 They deserve a good welcome home and the people of Lisburn did them proud. "We must also remember those soldiers who didn't make it back. They are remembered in the thoughts and prayers of all the people of Lisburn and my thoughts are with their families and friends today as their comrades walked the streets of Lisburn," he concluded. 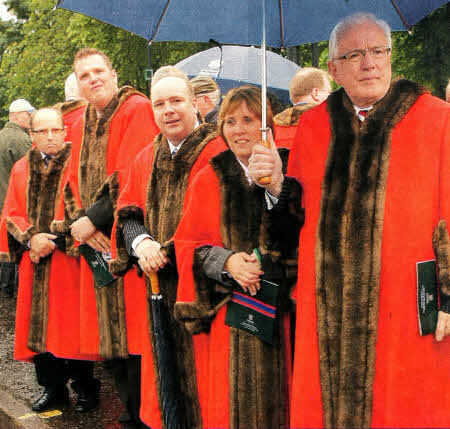 Former Councillor and Freeman Ivan Davis replied on behalf of the guests and recalled words Lord Eames had delivered at the commemorative service at the Cenotaph in London in 1989 to mark the tercentenary of the Royal Irish Rangers, stating that Lord Eames' remarks are still relevant over 20 years later. Mr. Davis went on: "This remains true today as the Royal Irish Regiment can indeed look back with pride in its tradition, its history and it continues to uphold the values of courage and honour marked by Her Majesty The Queen's award of the Conspicuous Gallantry Cross to the Royal Irish Regiment in 2006." Mr. Davis thanked the Mayor on behalf of all the guests for inviting them and giving them the privilege of being part of a 'wonderful occasion. "We all know that whatever the challenge, it will be met in true Royal Irish fashion and in the great tradition of bravery, self-sacrifice and service," he said.